India vs Australia 4th Test Sydney: Indian cricketer Kuldeep Yadav's latest gesture is bound to melt your heart. India vs Australia 4th Test Sydney: Indian cricketer Kuldeep Yadav’s latest gesture is bound to melt your heart. Ahead of Day 3, players from both nations assembled in honour of the Pink Day Test. The players were accompanied by young little fans. While the event was on, Kuldeep was spotted cuddling the boy’s cheeks in a heartwarming manner. 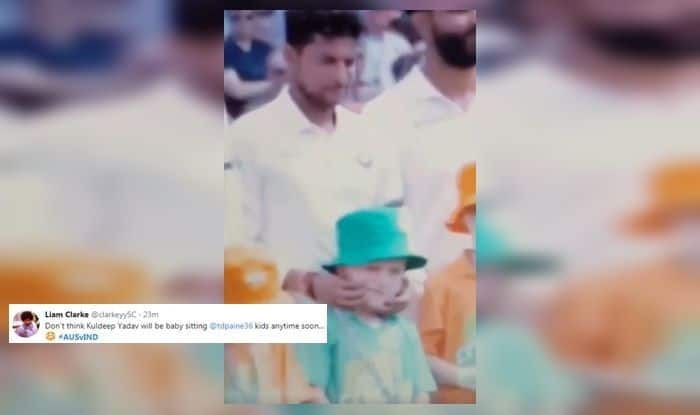 A social media user somehow found a connection between this episode and the incident in where Rishabh Pant was babysitting Tim Paine’s babies after Australian skipper gave him this unique solution while he was batting during the Boxing Day Test. Meanwhile, Australia is looking down the barrel on Day 3 after lunch. They are 144/3 and trail by 478 runs. Harris played well as he scored 79.